One of the most striking differences between the Yequana and any other children I have seen is that the former neither fight nor argue among themselves. There is no competitiveness, and leadership is established on the initiative of the followers. In the years I spent with them, I never saw a child argue with another, much less fight. The only angry words I did hear were very rare bursts of impatience from an adult with a child who had done something undesirable. There was then a little tirade of complaint hurled at them as s/he stood looking concerned or hurried to mend the error, and no grudge kept when the matter was put right, by the child or by the adult. Dear Abby: I have a sister I'll call Lisa, who refuses to contact any of the family. Granted, for years she was physically bused by our father, our mother was cold and emotionally abusive, and I guess the family in general was unsupportive. ­Everyone in the family thinks Lisa is being selfish, bit­ter and unforgiving, myselfin­cluded. I stood by my family. Li­sa turned her back. The last time I talked to Lisa, she said she had suffered great­ly due to the family and wants a life of her own. How can she do this? She claims she doesn't feel "safe" with us. I know our family isn't per­fect by any means, and I Know I haven?t been the greatest sister, but she can?t just leave! Right? She has a responsibility to this family. Isn?t she being neglectful to simply turn her back on us? Abby, you know how impor­tant family is. How can I get Lisa to admit she is wrong and re­turn to the family? Since Yequana women usually live with their mothers as long as the latter are alive, and the husbands must leave their mothers and take a place in the wife's family, it is fairly com­mon to find the wife taking the maternal position toward her husband in his crises. The wife has her own mother to draw upon, but instinctively gives maternal support to her man when he needs it. For orphaned adults, too, there is a custom that provides for adoption into another family. The strain on that family's resources is minimal, as the adult Yequana con­tributes more than s/he consumes in his or her family and receives from them a tacit guarantee of support if and when it is needed. That assurance alone, even if it is never called upon, is a stabilizing factor. 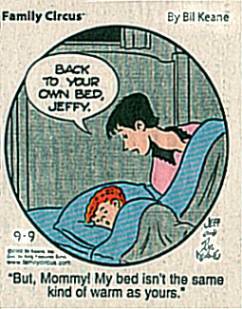 Children, longing for being close to another human are the subject of jokes in patriarchal societies (On the newspapers comics page in September, 2002). Isn?t that kid right? So, where is the fun? ?The man who sat on the ground in his tipi meditating on life and its meaning, accepting the kinship of all creatures and acknowl­edging unity with the universe of things, was infusing into his be­ing the true essence of civilization.? How many of us believe that to be civilized means to possess "things" and technology, to espouse Western theology and belief systems, and to be educated in abstract thinking? Doesn't "civilization" mean, as Chief Luther Standing Bear has said, to accept our place in "the kinship of all creatures" and the "unity with the universe"?